Irrigation is essential to a property’s year-round attractiveness. Water conservation is a high priority in the design of our landscapes. We Audit irrigation systems and current practices to identify opportunities for water savings. We specialize in efficient irrigation and water catchment systems to use this precious resource wisely. 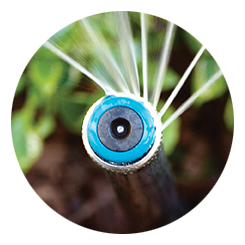 With careful planning our fully licensed team of experts can design, install, and maintain an irrigation system to your property’s needs. Our maintenance service includes pump and main line repair, diagnostics and electrical troubleshooting.